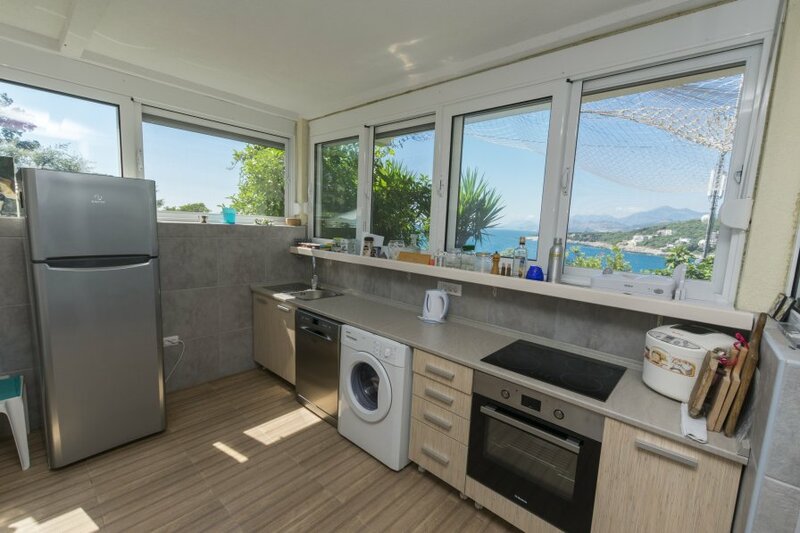 The 70 square meter apartment with a separate entrance and a sea view on the first floor. It was recently renovated in 2015 and can accommodate eight people. In the three bedrooms you have a double bed (160 x 200 cm) in the first and each two single beds (90 x 200 cm) in the second and third rooms. Two more sleeps offers the sofa bed (140 x 200 cm) in the living room, which is also equipped with air conditioning and satellite TV. The kitchen has a dining area and is furnished with a gas stove, mini oven, refrigerator, microwave, toaster and kettle. The bathroom has a shower, toilet and hair dryer. A bakery and a grocery store can be found only 50 meters away from your holiday home. The nearest beach is only 100 meters. The nature in this area is still untouched and intact. The airports Podgorica and Tivat are 50 kilometers away. In Ada Bojana 20 kilometers away there is also a nudist beach. Shifts are from Saturday to Saturday.